While lineworker Ariel Martin and her crew installed a light pole at a home in Asheville, N.C., fourth-grader Mia Eudy asked a question Martin, as one of the few female lineworkers, has been asked many times. The physical and mental challenges make the work exciting and rewarding. She’s been at Duke Energy for only a year, and, she said, probably would’ve done linework sooner, but there are so few women in the profession that she didn’t think it was an option. That encouraged her to attend a four-month program where she learned to climb, make repairs and understand electrical systems. 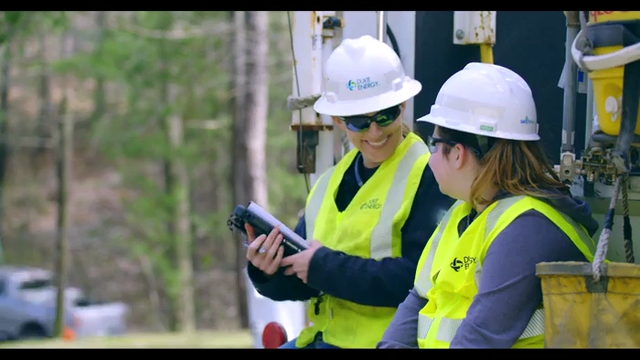 She came to Duke Energy in an entry-level groundman position after graduating, and any doubts she had about fitting in or keeping up are gone. Mia shadowed Martin and her crew for the second job of the day as they installed a 30-foot pole and attached 75-watt LED light at a customer’s home. Mia held Martin’s tablet for her as she filled out a form. Martin explained that as one of the newest teammates, one of her responsibilities is filling out this front-and-back paper that outlines the work they’re going to do, safety hazards and how they can prevent accidents. The tablet gives them details about the job so they can include it in their form. She writes down specifics including voltage, equipment, and actions that they’ll need to take, like hand digging a hole. After reviewing and signing the form, the crew started work. Martin picked up a pair of post hole diggers and started pulling out dirt. Sometimes they can use an auger. But Martin said this is a good workout. Mia is in Girls on the Run, an afterschool program that uses 5k training to teach girls about life skills and confidence, so Martin likened it to running. At first, it’s a chore, but then you start to enjoy it. Martin’s teammate Jay Tipton, right, gave Mia a chance to try it out. He taught her how the post hole diggers worked: drop it, close the handles and lift out the dirt. His advice for getting the most dirt? Pretend your brother or sister made you mad. Within two tries, Mia was pulling up diggers full of dirt. Tipton offered to take the diggers back, but Mia wanted to finish the job. With the hole finished, they were ready to move the pole from the truck to the ground. Mia asked what the orange box Martin was wearing around her neck was for. Martin explained that it’s a remote control for the truck’s boom. As Martin operates the controls, the pole moves closer toward the hole and one of her teammates helps guide it by hand. Once the pole is in place, the crew secures it and makes sure it’s straight. Tipton showed Mia a trick. He handed her a string with a weight tied to the bottom and told her to line up the string with the middle of the top of the pole. If the string runs all the way down the middle of the pole, you know it’s straight. When the light was attached, and the job done, Martin asked Mia if she’d want to be a lineworker. Mia said probably not because her legs would give up, but Martin assured her she could do it if she wanted. Mia told Martin that she wants to be a designer when she grows up but admitted she changes her mind often. She’s gone from chef to veterinarian to comedian to designer and is glad she has the freedom to choose.